Download our different apps and leaflets and carry the Basque Country round on your mobile. In the Basque Country, despite its small size, a huge variety of surprises await you. You can find out more about them in this brochure In addition, discover "10 essential activities for savouring the Basque Country"
The Basque Route is a series of suggested car or motorbike routes along many of the most seductive scenic roads in the Basque Country. It is designed to help the traveller enjoy Basque cities, nature, culture and gastronomy. 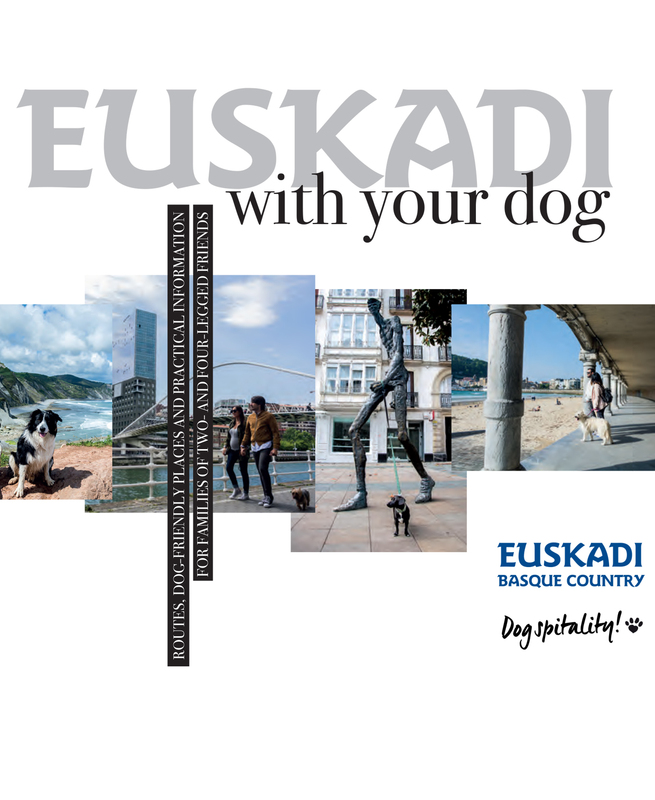 Euskadi (The Basque Country) is the perfect destination for you and your dog, as long as you do so responsibly. The following pages include dozens of plans and hundreds of dog-friendly accommodation options, restaurants, shops and attractions that welcome you and your furry friend. We hope you enjoy the best doggy-plans, complying with the standards established by businesses and towns responsible for regulating the use of public spaces. You can obtain more information and details in the practical information in each area. We recommend you consult all the information on each location before visiting. The Basque Coast offers an unbeatable combination of natural surroundings and activities on the sea... and with sea views, from land and from the air. This publication presents the plans for active tourism and ecotourism on the Basque Coast, with approximate prices and contact details of the companies offering the activities: boat trips, surfing, canoeing, diving, whale and bird watching, coasteering, hiking, cycling, Stand Up Paddle and many more. Road map to help you plan your route along the Basque coastline, between Bilbao and San Sebastián. It proposes 4 sections but gives the necessary information for you to plan whatever excursions and routes you like: recommended roads with distances and estimated times, essential visits and ideas along the way, telephone numbers of all the tourist offices on the coast and so on. On the back is an introduction to the Basque coastline and the 10 places not to miss on your trip. If anything characterises the Basque Country, it is its excellent cuisine and the quality of its restaurants, from the most sophisticated, to the most humble. Basque traditional cuisine, based on simple elaboration processes, bases its success on the quality of the raw materials (fish, meat, cheeses, etc.). On a parallel level, new trends are appearing in Basque nouvelle cuisine, which incorporate new ingredients, aromas, textures and combinations. All these dishes are always accompanied by Rioja wine, from the region of Alava, or with cider or "txakolí" (Basque white wine); all three wines that are typical of Euskadi. Discover “Where to Eat”, “What to Visit” and “Where to Shop” in the Basque Country with the Wine and Food Tourism Guide. A guide that shows you everything Basque wine and food have to offer you. From the most sophisticated pintxo bars, grill restaurants and cider houses to Michelin-starred, Repsol Sun and 50 Best listed establishments, plus traditional markets, food and wine museums, and even gourmet food, wine and cake shops where you can take away a sweet souvenir of your visit. On this map you'll find everything you need to enjoy a gastronomic experience in the Basque Country with all five of your senses. Visit places where you can find out more about Basque cheese, cider, wine or txakoli from the people who actually make them. Dine in one of our gastronomic temples, restaurants, cider houses, grill restaurants and pintxo bars and visit our gourmet food and wine shops to take away a delicious memory. Visit our website euskaditurismo.eus and look for our "Euskadi Gastronomika" seal: there you'll find the best places and experiences to enjoy Basque food and drink. The Basque Country, ideal for a short-distance family visit. Discover the Basque Country with fantastic plans. We offer you experiences to let you get to know at first hand our cuisine, our traditions and culture, our villages and cities, our historic sites, our natural setting and more. Plans to suit all tastes, audiences and pockets, to leave you with unforgettable memories. 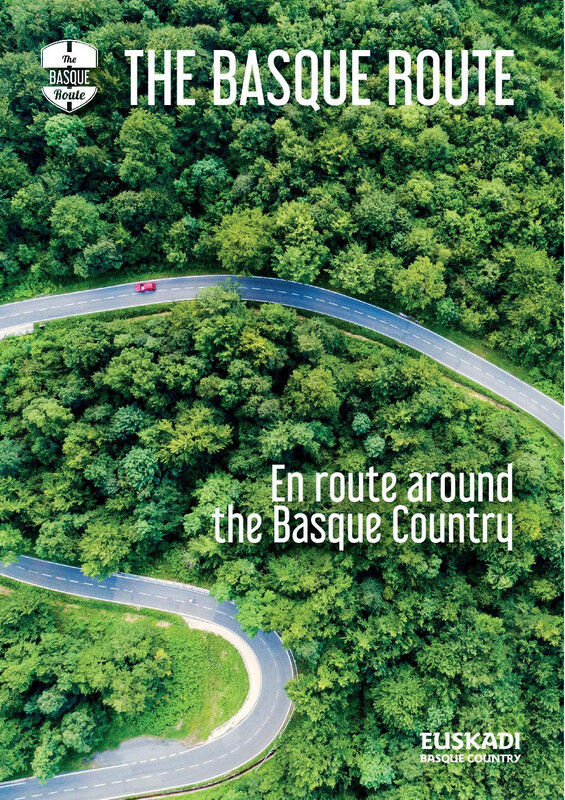 On the front of the map includes, as well as the road network, the 10 indispensable routes, the 10 TOP experiences and the 10 PREMIUM experiences for the tourists who come to the Basque Country. Furthermore, you can see the complete itinerary of The Basque Route, a suggested route made up of 8 road stages through the Basque Country. Meanwhile on the back, you can find suggestions for an overall view of the Basque Country: a description of the 10 indispensable routes, 3 maps measuring distances from each capital city in minutes, a description of the 10 TOP experiences and a brief explanation of The Basque Route. The Ignatian Way retraces the route taken by the knight Ignatius of Loyola in 1522 from his birthplace in Azpeitia, Gipuzkoa, to the Catalonian city of Manresa. Following his spiritual conversion in Loyola, he set out on the pilgrimage with the intention of reaching the Holy City of Jerusalem. Rioja Alavesa is a region where the culture of wine permeates everything; where the people see coexistence and hospitality as a way of life. It is a perfect place to enjoy stunning landscapes of endless vineyards, dotted with olive trees and ancient dolmens, medieval towns with their walled enclosures, stately mansions and churches of quiet beauty, and of course, an infinite number of wineries that combine tradition and modernity. A mountain bike, panniers and a desire to enjoy and discover wonderful places is all the traveller needs to start out on this adventure, which begins and ends at the Ataria Visitor Centre. (Vitoria-Gasteiz). The Geopark on the Basque Coast is a small area wedged in between the Bay of Biscay and the Basque mountains, and comprising the municipalities of Zumaia, Deba and Mutriku. Since 2010 it has been a member of the European and Global Geopark network sponsored by UNESCO. The Urdaibai Biosphere Reserve has one of the greatest diversities of plants, animals and landscapes in the Basque Country, and a series of highly valuable natural systems and habitats including estuary, river, karst, coast, and holm oak forests. All of them are recognised under the Natura 2000 network, the European Union’s main instrument for nature conservation. There are various waves on the Basque Coast which, given their quality, are internationally recognised and catalogued as World Class waves. In ideal wind, swell and tide conditions, these breaking waves offer mythical sessions. These include Punta Galea, Meñakoz, La Central, Mundaka, Ogeia and Orrua. The Basque Country is the ideal destination for looking, listening, touching, sharing and enjoying; in essence, it invites people to open their hearts and indulge their senses. This guide is an invitation to come and savour the Basque Country.